TCF WA / TCF Australia & Belmont BEC are hosting a Buying Missions to Hong Kong Fashion Week (Fall/Winter)* on behalf of the Hong Kong Trade Development Council. You are welcome to on forward this information to other designers or retailers that may be interested in attending. 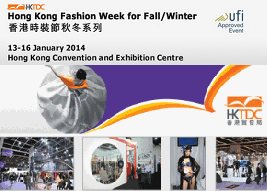 HKFW offers Hotel Sponsorship Registration & VIP Privileges* to eligible businesses.